This home came to my attention because, like so many of our historic homes in Cincinnati, it has been neglected and is under its second review as a public nuisance. The property is the large house in the upper left corner of the outlined area. The outlined portion lines up (mostly) with the present day CAGIS map. Ok, first surprise! 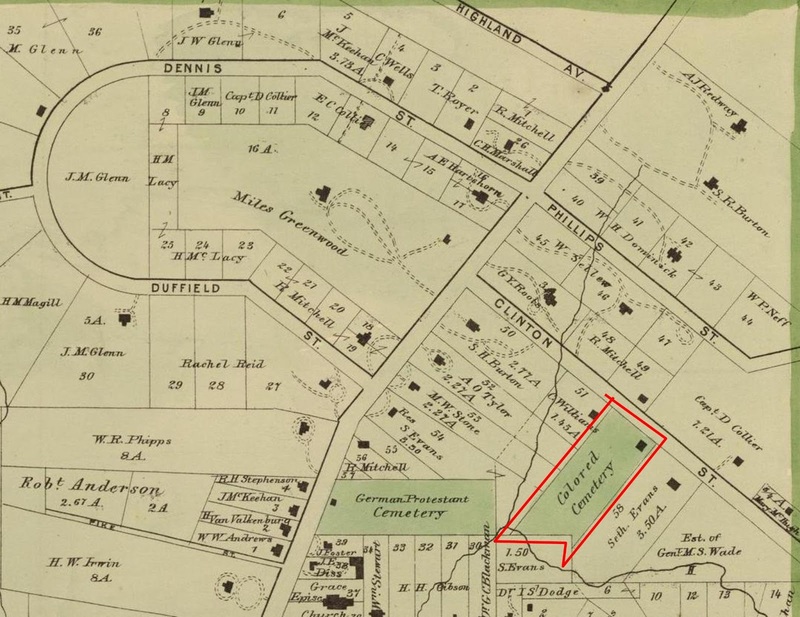 The land where the home at 965 Burton Avenue is today was once an African American cemetery. 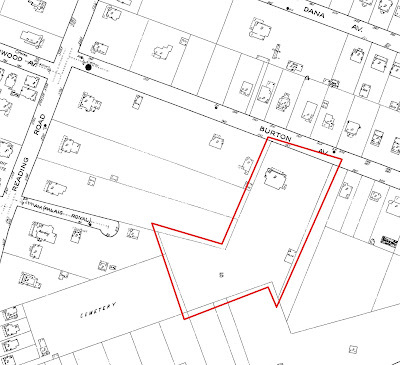 Something else to note, Burton Avenue was then called Clinton Street. 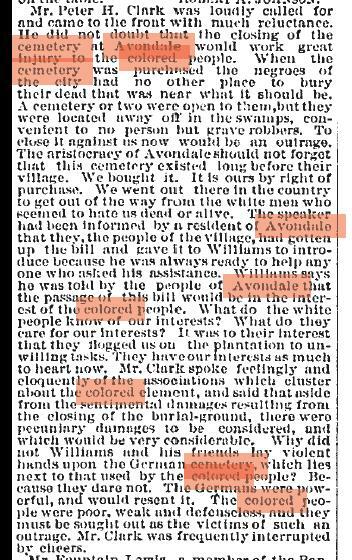 Remember, at this time, Avondale was a separate village outside of Cincinnati. There was also a Clinton Street in Cincinnati, in the West End, near the new Taft Information Technology High School on Ezzard Charles Drive. After looking through some city directories for Mary A. Wolfe in 1888, I figured out whomever placed the home on the National Register got the two Clinton Streets mixed up. Mary Wolfe did live on Clinton Street, but in the West End, not Avondale. Second surprise! 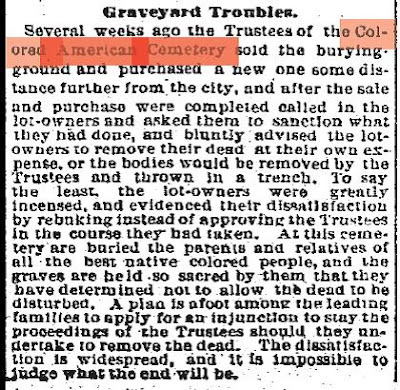 So who built this home on an old cemetery and where were the beloved dead moved? 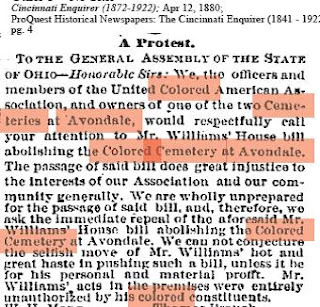 As you can read above, a controversy started in 1880, when an African American state representative presented a bill to the legislature to close the Colored American Cemetery in Avondale. Members of the African American community came together to oppose the closing. A portion of the speeches is below. Wow, the above article was shocking for me to read. I hope the bodies were all removed by their families and given a proper burial, not thrown in a trench! 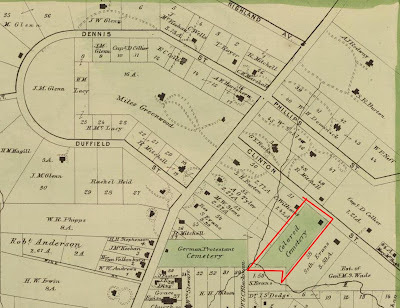 It appears from further research that the land was purchased by the neighbor next door, the Evans family, who appear on the 1869 map above. 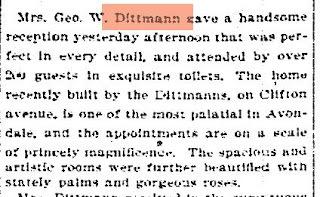 The land stayed vacant until 1894, when the present home was built for George W. Dittman (sometimes also spelled Dittmann). 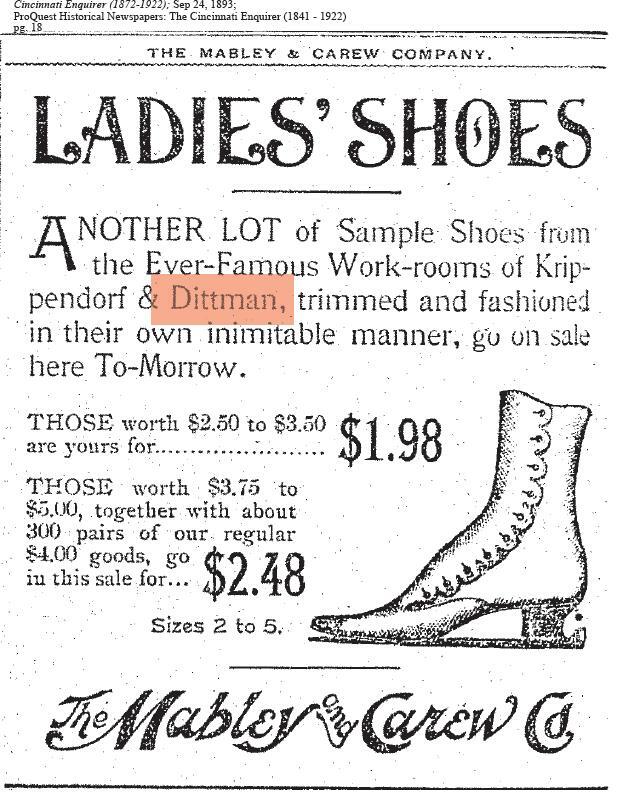 He was co-owner of a prosperous shoe making business in Cincinnati, Krippendorf & Dittman. He was born in Missouri in 1849, was married to Abbie and had four children - Florence, George, Edmund and Ruth. 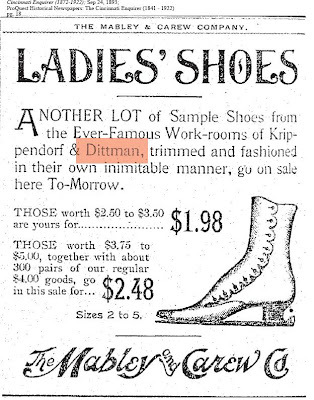 I confirmed the Dittman's owned this home by checking the city directories. They first listed their home on Clinton Street, Avondale in 1894 and then as Burton Avenue in 1896, and finally as 965 Burton Avenue in 1897. This article state the home was recently built, disproving the original build date of 1888. 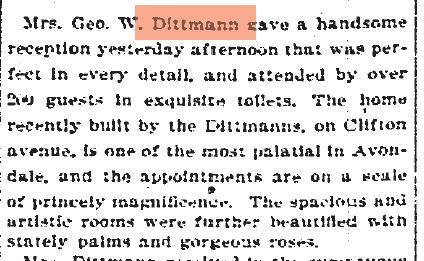 The Dittman family lived in this home through the early 1900's. George passed away in 1925 and Abbie in 1926. 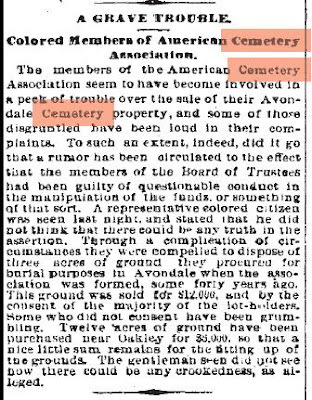 They are buried in Spring Grove Cemetery, along with Florence and Ruth, who never married, and Edmund and his wife Clara. The home was sold in 1928 to Jennie Erman, a widow, who lived with her son, Effie, an insurance agent. The Erman's lived here until at least 1940. 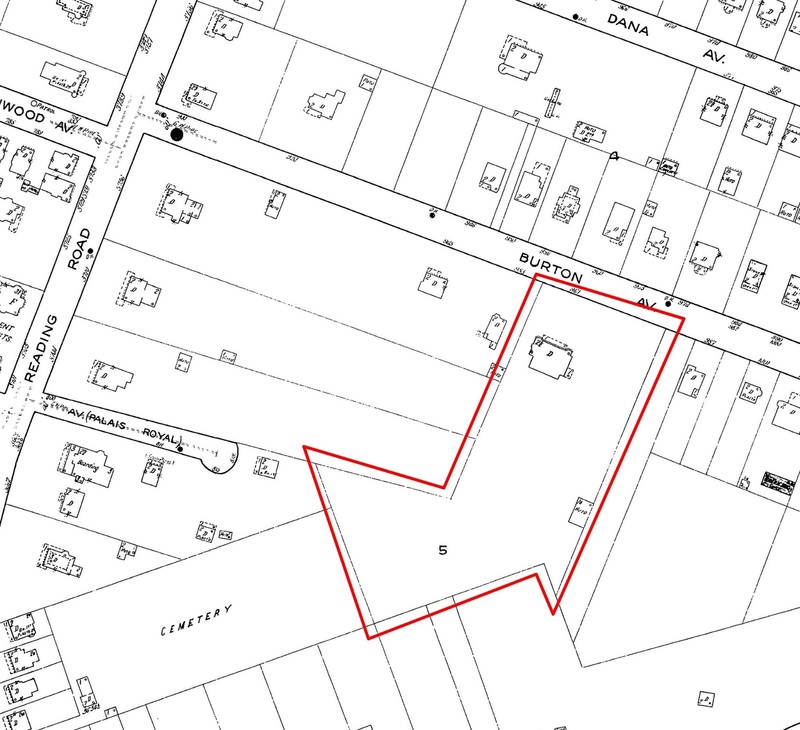 You can see from the ownership card below, the property changed hands quite a few times from 1940 until 1974. At some point in the 1990's it became a nursing home. As you can see above, it seems interior details were removed when the home was converted. Recent reports from 2009 and 2010 state the home has a leaky roof with damage occurring to the floors, causing them to be ready to cave in and of course, because of the water, mold damage is also apparent. Other comments can be seen on this blog post from 2010. The home was condemned on September 24, 2012 for structural damage, vandalism, and neglect. Even with obstacles to face, a home that has merited a place on the National Register of Historic Place should receive more care and attention. I will update this blog post after the hearing on January 25, 2013. If you would like to attend, the hearing will take place at 1:00 pm at 3300 Central Parkway. Thank you so much for all of this wonderful information! I have always admired many of Cincinnati's historical homes but I really don't know much about their history. I love getting to know the "real deal" facts. Its so sad that such a beautiful place was not revered as such and maintained by its many owners. Can you please please update? I am seeing that it is set for demolition! Please update! It's marked for demolition!!! According to the Cincinnati Preservation Association: "It's in really bad shape with serious structural issues. We've been working with North Avondale Neighborhood Association to try to save it and should know more in a few weeks." Thanks for prior information. Current status? 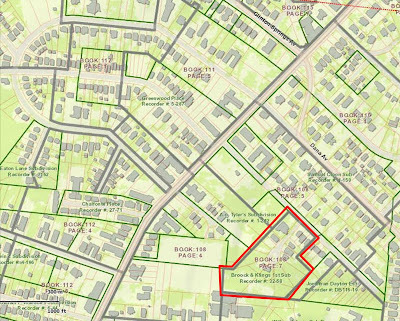 Is there a possibility of the property being legitimately added to historical registry? I think this might be my favorite blog post you've ever done! So, who knows its current status? I would like to purchase the home. Any help with resources would be great. I love Cincinnati history and enjoy researching families and buildings that make this city wonderful.